Construction of a red contra-flow bus-only lane and pedestrian safety upgrades at the hairy intersection of Market, Haight, and Gough Streets is on track to begin in January and be completed next summer, according to the SFMTA. The plan to create a more direct route for riders on Muni’s 71-Haight/Noriega and 6-Parnassus lines, approved by the SFMTA Board of Directors two years ago, is expected to come along with sidewalk bulb-outs, pedestrian refuges, and new greenery. Currently, standing on the intersection’s northern pedestrian island to cross makes you “feel like a total loser,” said neighborhood advocate Robin Levitt at a meeting last night of the Hayes Valley Neighborhood Association, where residents seemed to welcome the project. The pedestrian safety improvements were rolled into the two-way Haight project along with sewer work, which adds to the seven-month construction period. SFMTA staffers said the 71, 6, and F-Market lines are expected to be temporarily re-routed during that time. HVNA also suggested some adjustments to the plans to expand sidewalks and pedestrian islands, such as adding a bulb-out on the narrow east corner of Gough instead of the west corner, and moving the car parking lane to the east side to add protection for pedestrians. 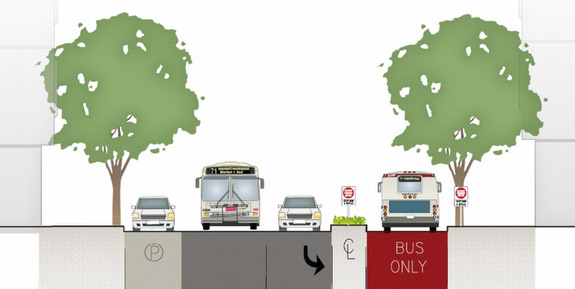 An HVNA sketch submitted to the SFMTA also included shifting the pedestrian island further to the west to make more room for passing buses. SFMTA staff said that bulb-out adjustments could be made with approval at a public hearing. Even though all car parking will be removed on the south side of Haight’s easternmost block, there will actually be a net gain of four parking spaces in the area because, with a more direct bus route, several stops will be removed and re-purposed for parking. Jason Henderson, HVNA’s Transportation and Planning Committee chair, says those spots should instead be removed from Page Street between Buchanan and Octavia, where eastbound bicycle commuters must typically squeeze between long lines of drivers waiting to turn on to the Central Freeway. “The bus stops should not be given over to parking,” he said. Haight Street looking eastbound from Octavia to Gough. I hope a bus-only lane extends to Laguna or the routes will still be stuck waiting for traffic to turn onto the Central Freeway (as they already are at Page). It does. Check out this previous post for more details. Sweet. My regular reading of streetsblog has been reduced as of late. I hope Franklin/Market/Page is next. Page St eastbound onto Market gets a ridiculously long light, so cyclists eastbound on Market either take advantage of the empty intersection to run it, or sit there staring at a deserted intersection waiting for the light to change. I don’t run lights anymore, but more than any other one I encounter in my rides around the city, this is the one that tests my resolve. Actually, between the Page St crossing and the pedestrian crossing of Market there, I’m not sure if there’s a stronger case anywhere for the Idaho Stop. Not to mention that the green bike lane on Market is disappears *just* at this intersection, so someone on a bike waiting at that red light has to stare at an empty intersection while standing in the *middle* of the road. SFMTA should send out a survey with one question. This project is a significant improvement for Muni routes 6 and 71 riders and it also provides some good pedestrian improvements. However, more safety improvements could be achieved. I agree with Jason Henderson’s suggestions to improve Page Street for cyclists and to remove one of the four traffic lanes on Gough just north of Market. From my experience (having worked on Gough just north of Market), motorists tend to speed up shortly before Market (in order to make the light). A three-lane Gough would likely help to reduce speeding. Taxis should be allowed to use the special lane as well. Does anybody know if bulb-outs have been considered for the local-access lanes on Octavia? After observing/dodging an oblivious stop sign-runner there I realized that the stop signs are far over on the right behind the parked cars, and they could be moved closer to the traffic lane by putting them on a bulb-out. It would be cheaper to just daylight (red-curb) those intersections, but I’ll take either option. I can take daylighting, but part of the problem seems to be that the traffic light on the adjacent boulevard is closer to the drivers’ sight line than the stop sign. Raised crosswalks would also be a good option.